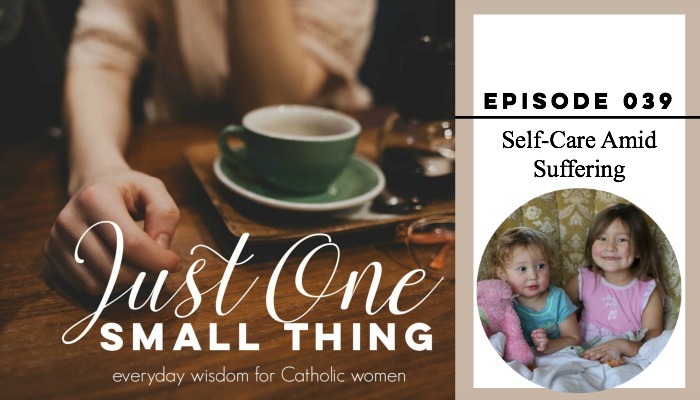 Today’s podcast episode is a bit of a personal one, so if you are sick of hearing me share about the baby I lost last fall, you might want to skip this episode. You see, although we have been infinitely blessed by and through the still-birth loss of our little Maximilian on Thanksgiving Day of last year, we are approaching his due date, and suddenly the pain is very real once more. Although I have weeks and months to get my mind around the idea that he won’t be joining our family here on Earth, it is still hard to really understand just how different this spring will be from the spring I had imagined while I was pregnant. Max was due on April 11th. So, due to my own pain and continuing hurt, I have started to reflect on the fact that we really do need to take care of ourselves while suffering. Maybe this is pretty obvious to you, but it wasn’t to me. I 100% believe in the value of suffering. I don’t like to suffer, but I see how redemptive and purifying it can be. So, the idea that I might need to protect myself while suffering, that was an idea that Laura from Mothering Spirit had to really pound into my head, and thank goodness she did. The core experience that got me thinking about self-care amid suffering is my wonderful Thursday morning Bible Study. The study, the women, the parish, the Catechesis of the Good Shepherd program opposite it… they are all so great and I love that Bible Study. It’s just that there are SO MANY pregnant ladies there. After much pain and reflection, I decided that I just couldn’t be there this Spring, as I longed from my own baby, already in Heaven. But, my kind of suffering is not the only kind of suffering that demands self-care. Just basic mothering is a form of suffering that demands self-care, which, if you are anything like me, you are terrible at. This episode is a lot of food for thought. And, if you have an extra prayer or two, I would appreciate them this Spring as we mourn our little Max. I suspect that it is a nearly UNIVERSAL problem faced by new mothers: when do I find time to pray? Many of us had pretty good prayer lives before that first baby arrived. We had a routine and a set time that we prayed. Perhaps we had adoration hours or a nightly routine that involved prayer. And, if you are like me, you had no idea that having a baby would change everything, including prayer. But then the baby arrived and somewhere amid learning to breastfeed and sleep loss and becoming a mother our prayer life died. This is pretty much exactly what happened to me. In fact, it has taken me YEARS to figure out that as a mother prayer will just be different. Sure, I would love to enjoy hours of quiet, solitary prayer, but that just isn’t going to happen now. Maybe at some point in the future, maybe from time to time, but not reliably now. Because of this all I am THRILLED to share the wisdom of Lauren Nelson on the podcast. 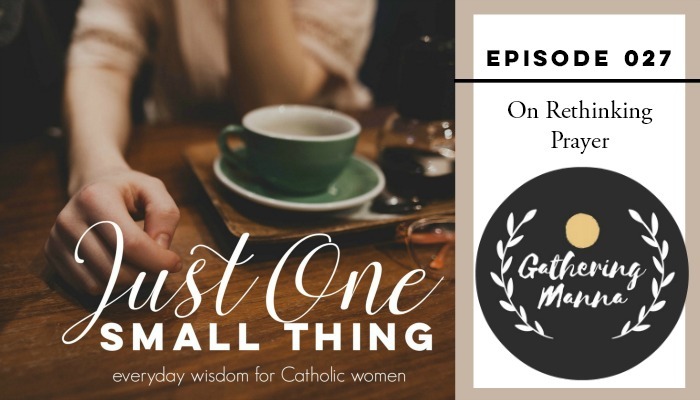 Lauren is the Momma behind GATHERING MANNA, a new site for Catholic women struggling to pray amid the demands of life and motherhood. And Lauren’s answer to this struggle is rather simple. WE NEED TO RETHINK PRAYER. Prayer does not have to be something that fits into a specific pocket of time. Prayer does not have to be an entire rosary or full hour of scriptural meditation. Sure, those things are awesome, but they are not the only way to pray. And, most importantly, prayer will never be something we “master” or something we graduate from. The more we pray the more we will want to pray and the closer we get to God, the more we will want to be with Him and share with Him. Prayer can simply be the rhythm of our lives. And, prayer is, at it’s core, little more than a returning to the Lord, a glance, a thought, a look toward heaven. An acknowledgement that He is gazing lovingly at us at all time. So, go listen in. Her wisdom will change with way you think about prayer. And, make sure to connect with Lauren over on her new site, Gathering Manna (launching the end of January). Until then, go join the conversation on her Facebook page. A BIG thanks to Lauren–and thanks to all of you wonderful ladies! 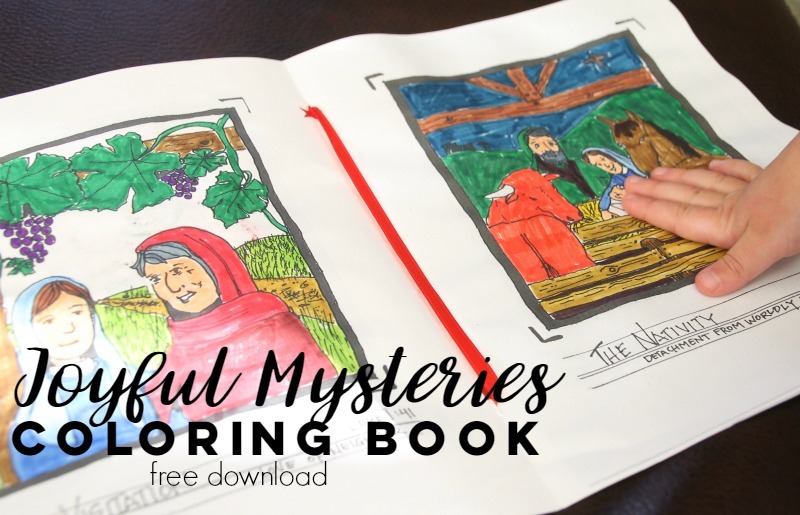 Today I’m thrilled to be sharing another one of my Uncle Dan’s hand-drawn creations: The Joyful Mysteries of the Rosary Coloring Pages. 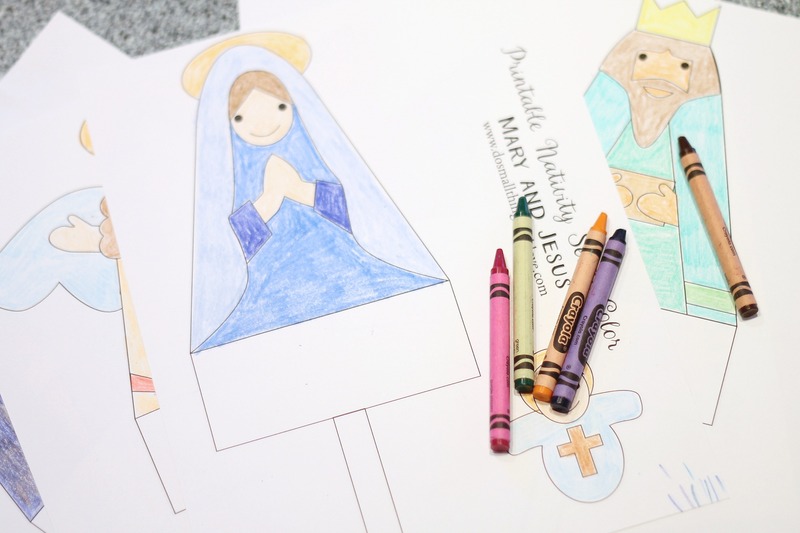 Just like the Pop-Up Baby Jesus Activity I shared from him before Christmas, he is allowing me to share this meaningful coloring book with you totally free. Just download, print, color and (hopefully) pray! The PDF is set up to print out the coloring pages as a booklet. If printed on 8.5″x11″ paper you will have a 1/2 sheet sized book. For a full paged size book, print on larger paper. 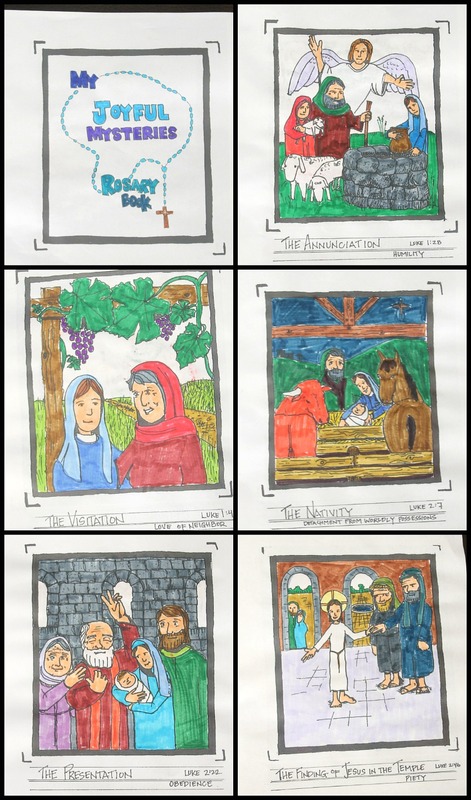 Here is a peak at all of the pages in the book, one for each decade of the Rosary. In the images below the pages are colored in. The free download has the pages blank and ready to be colored. Not only did my Uncle Dan draw such wonderful, meaningful images, but he also took the time to include the virtue paired with each decade. The kids and I worked on coloring up a booklet yesterday and the simple inclusion of these virtue brought about all sorts of productive and virtue-building conversation. 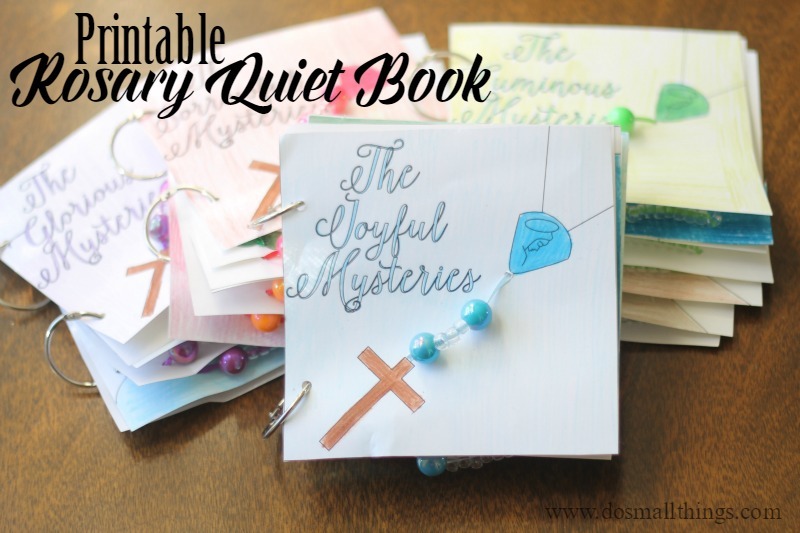 Rosary Quiet Book. Find the pattern and directions for making these meaningful felt quiet books HERE. 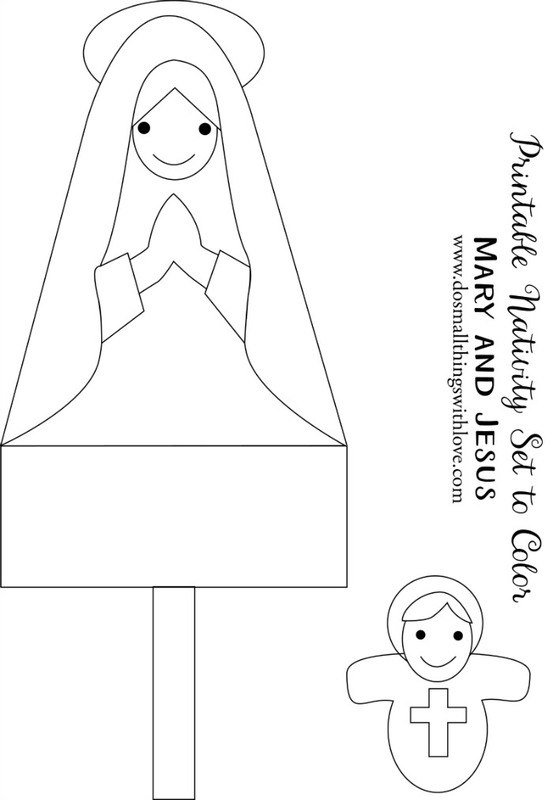 Printable Rosary Quiet Book. 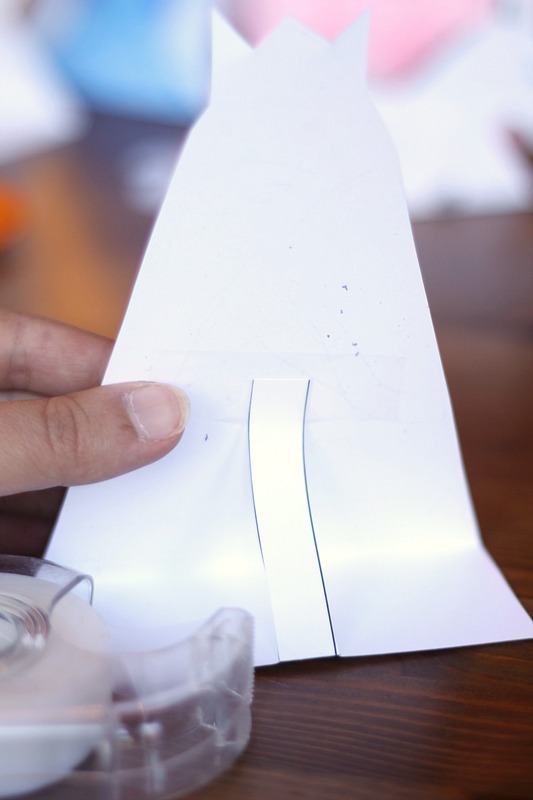 Get the PDF download and full instructions HERE. Patron Saint Rosary Case. Pattern and Directions HERE. Once again, a big thank you to my Uncle Dan for sharing his talent with all of us. If you do decide to download and use this free coloring book the only “payment” I ask is that you share with post with others so that they too might benefit from it as well. Thanks, as always, for being here! And God Bless. We have so much stuff. It’s incredible. Less than a year ago I seriously purged before a big cross country move, and yet here we are, in a house full of stuff, once again. Some days it feels like all I do is manage the stuff. Are you with me? So, the very last thing I want to do this Christmas is get my kids more STUFF. Yuck. My husband, in all his wisdom, suggested long ago that each of our children get 3 gifts on Christmas because, as he put, “If 3 gifts were enough for Jesus, 3 gifts are enough for our kids.” So True. Each year we give our kids one big gift and two smaller gifts. 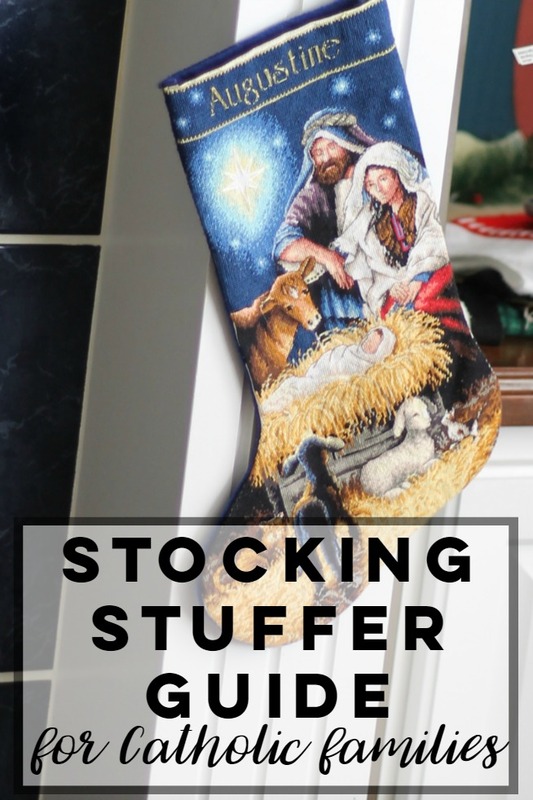 These smaller gifts fall into the category of “stocking stuffers” for me, even though they likely won’t end up in the stocking, or are too big for a stocking. Since it is Christmas, you know, Jesus’ birth, we are sticking with faith-filled smaller gifts for our kids this year. And, because I love all of you and all of these item–I thought I’d share the gifts we are getting, as well as a few gems from previous years with you! 1. The Glory Stories from Holy Heroes. We are WAY into audio books around here. Many days, audio books are they only way I survive. So, I was thrilled when I found these Glory Stories from Holy Heroes. They are incredible and my kids love them. Many of them pair with coloring books. And, I really enjoy listening to them myself–and even learn a lot too. I plan on investing in the whole set soon. Here is something I grew up with! I watched these CCC Saint movies as a girl and loved them. We don’t watch much TV at home…but we do have screens in our car and I’m excited to put these on for the kids instead of Disney. Don’t you just love cool Catholic things? 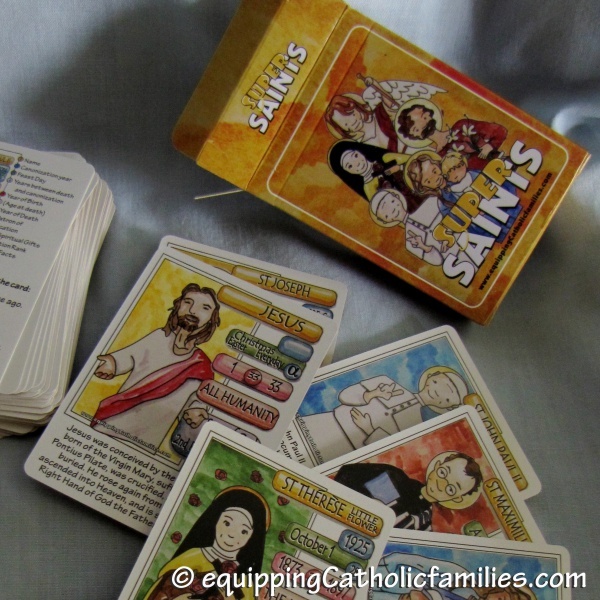 The kids are really into games and playing cards and I think we are going to have a lot of fun with these beautiful playing cards from Equipping Catholic Families. I ordered mine just today. 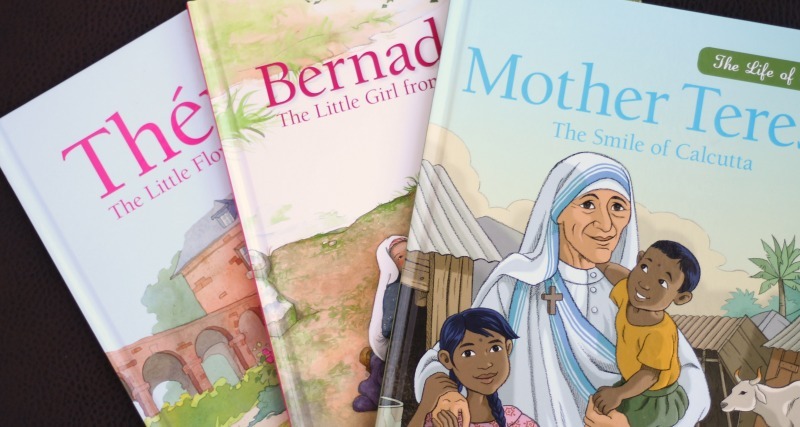 The Magnificat offers some beautiful illustrated saint books. We gave these books to our kids last year and read them often. A great investment for any Catholic Family. And here is something crazy cute for your baby. A miraculous medal onesie. I mean, seriously? I can’t express how much I love this (and this sweet little chubby baby of mine!) The shop linked above also has a ton of other adorable super Catholic onesies, if you want to stock up. 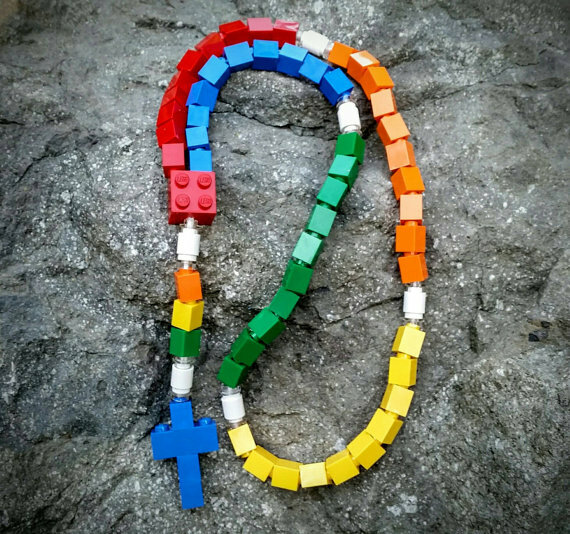 I have already ordered a Lego Rosary for each of our boys and my Godson because, duh. They are so cool, aren’t they? Why am I just hearing about these now? I can not wait for the boys to get them. They come in loads of colors. Get them from THIS SHOP on etsy. 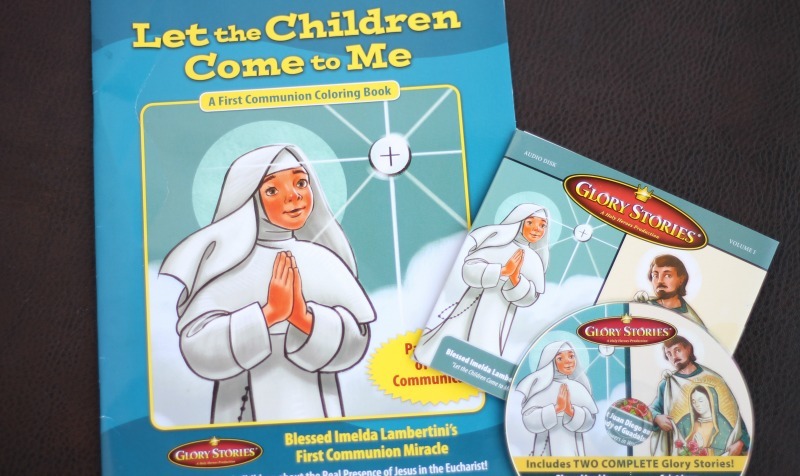 I have already made and given my children a Rosary Quiet Book, but I continue to see how much my kids love the rosary because of the quiet books. The pattern is only $6, but this is a pretty work-intensive project. BUT, if you are up for it you might just have enough time to make it for Christmas. 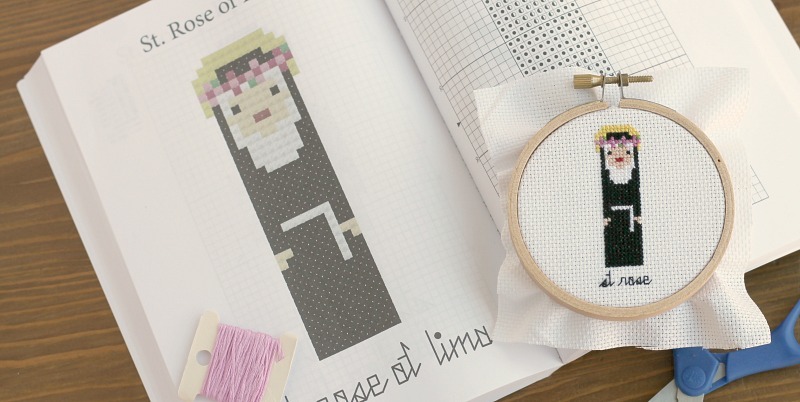 And finally, the Catholic Saints in Cross Stitch. I know, I know. I have been talking and talking about these patterns and this book. I just wanted to wrap up this list with my current project. 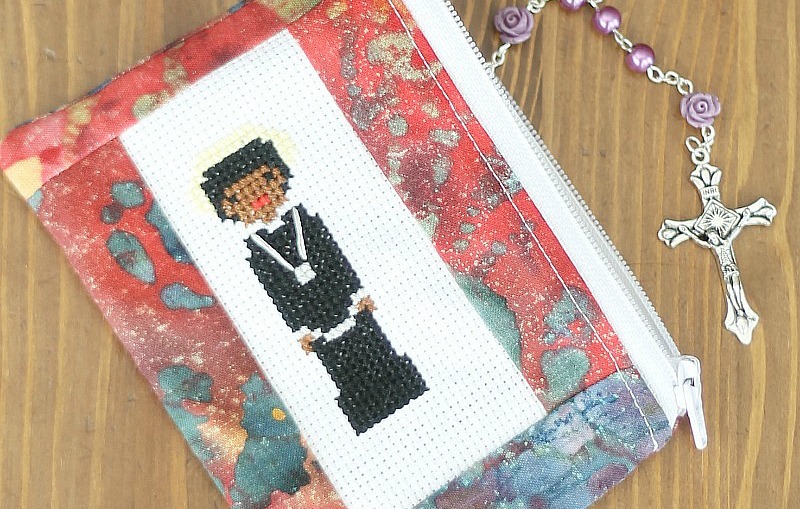 Right now I am stitching up each of my Godchildren and children’s patron saints on 18 ct. cloth. 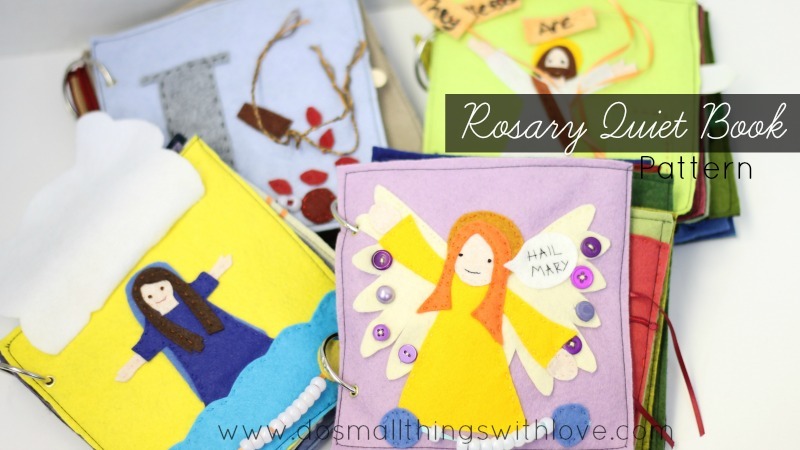 I plan on using these stitched saints to make a little rosary pouch for each of them. And that pouch, along with a cute little rosary, will be their Christmas gift from me. I know that a rosary case and rosary might not get the screams of delight from my Godchildren that some toy might, but I really pray that by giving them a personalized sacramental they will hold onto it and treasure it and (hopefully) USE it. I can’t tell you how many rosaries I have owned and lost. But there is one, which my beloved Grandma Anne gave me on my confirmation, that I use and cherish even to this day. Maybe these rosaries will be lost immediately. But I’m hoping with every little stitch I make that they have some sort of an impact on the souls of my wonderful Godchildren. And there you have it! 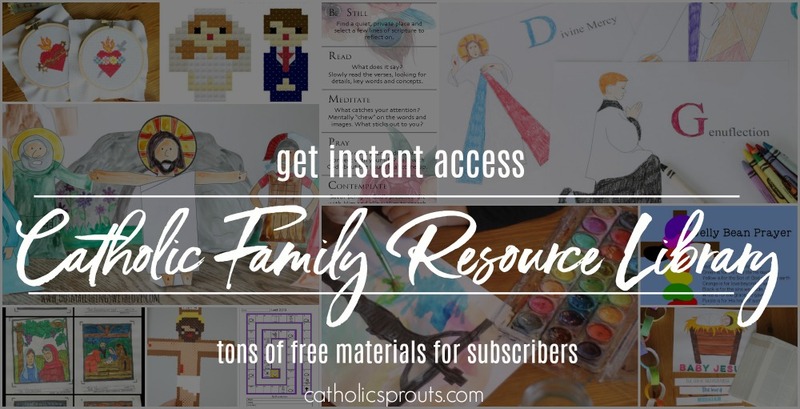 Please, if you have other ideas for Stocking Stuffers perfect for Catholic Families, leave them in the comments and I will work to add them to the post. Advent is literally right around the corner and I am so thrilled to be sharing with you a little project I have been working on lately: a Printable Nativity Set Advent Calendar to Color. I’m so excited about this project because is something my (and your) family can enjoy without hours of laborious crafting. If you have followed my blog for any amount of time, you have probably seen that I share lots of crafts which call for such tedious things as hand stitching and intricate cutting, but more than anything TIME. And all of the sudden it’s November and all of that Christmas crafting we intended to do, well it doesn’t look like it is going to get done. I must not be the only one feeling this way because lately I have been overwhelmed with requests for made version of my Felt Nativity Set and my Jesse Tree Ornaments. People write that they want these things for their families this season, but they just don’t have time to make them. And I get that. I don’t have the time to make them either. 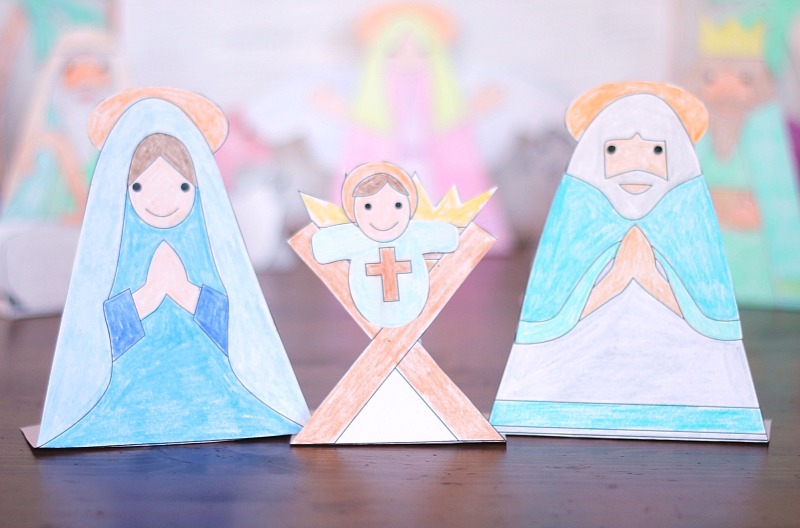 So, for those of us stuck in the hectic and blessed years of little ones I made my Nativity Set Into a Printable. It might not be as soft and snugly as the felt version, but in about an hour you can print it, have the kids color it and have it set up for Christmas. Boom. Mission accomplished. 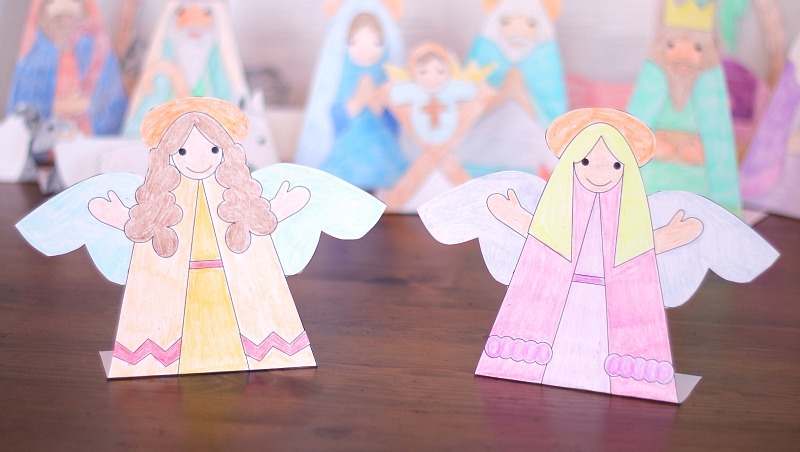 And what’s more–I made this printable nativity set into and ADVENT CALENDAR too! 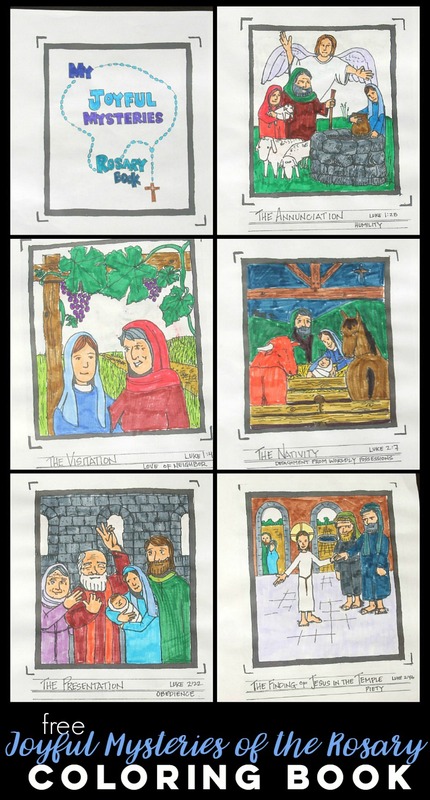 That’s right, print it, color it and either set it all up as a full Nativity set right away or add one piece each day of Advent. The 3 Kings, with their 3 Trusty Camels. 2 sweet cows, the Holy Family’s donkey and a kitty cat. Of course there was a kitty there. Along with the stable, 2 trees and star that makes 25 characters. The PDF comes with full instructions and a guide for using this as an advent calendar and what character to set out each day of December. Here’s a closer look at the coloring pages. 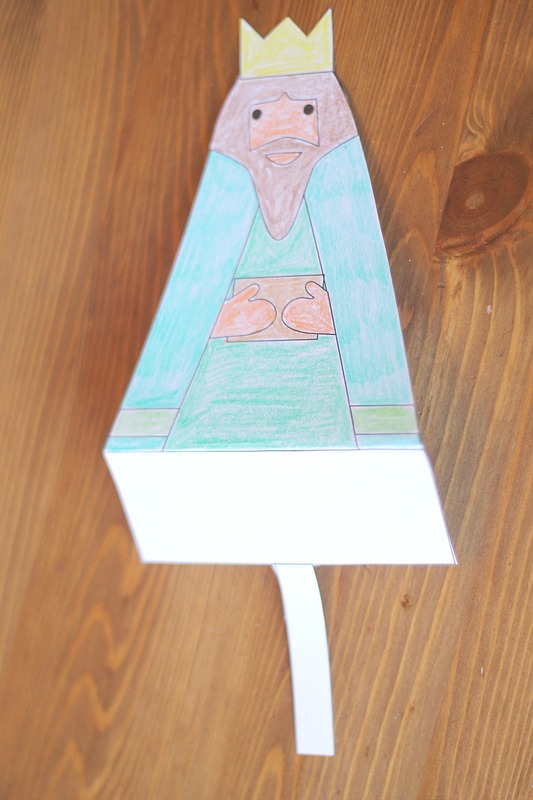 I designed this Nativity Set Advent Calendar to be both easy to color and easy to cut out so that a young child can have fun coloring it…or even an adult. Come on, adult coloring is totally a thing now! Since my kids are still more scribblers than colors I colored this version…and I may have enjoyed myself very much! Here is what the Mary and Jesus page looks like. As you can see from the printable, I designed these characters to stand up, but they have to be printed on sturdy cardstock. The steps are pretty simple, but I took pictures of them anyway. 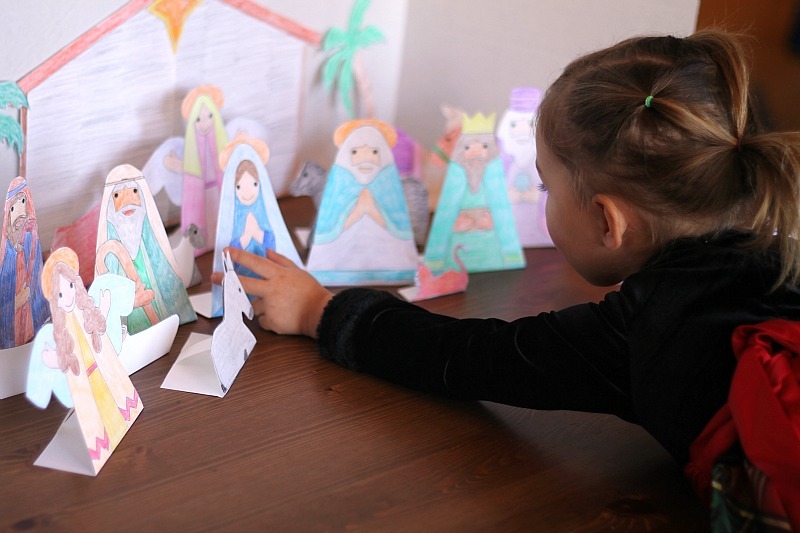 And then bingo, you have an adorable nativity set that not only your kids helped make, but one that they can play with all advent long without the worry of loosing or breaking something. We already have ours set up and it has been played with quite a bit. Bernadette is most interested in Mary and Jesus…and the kitty. So, there you have it. 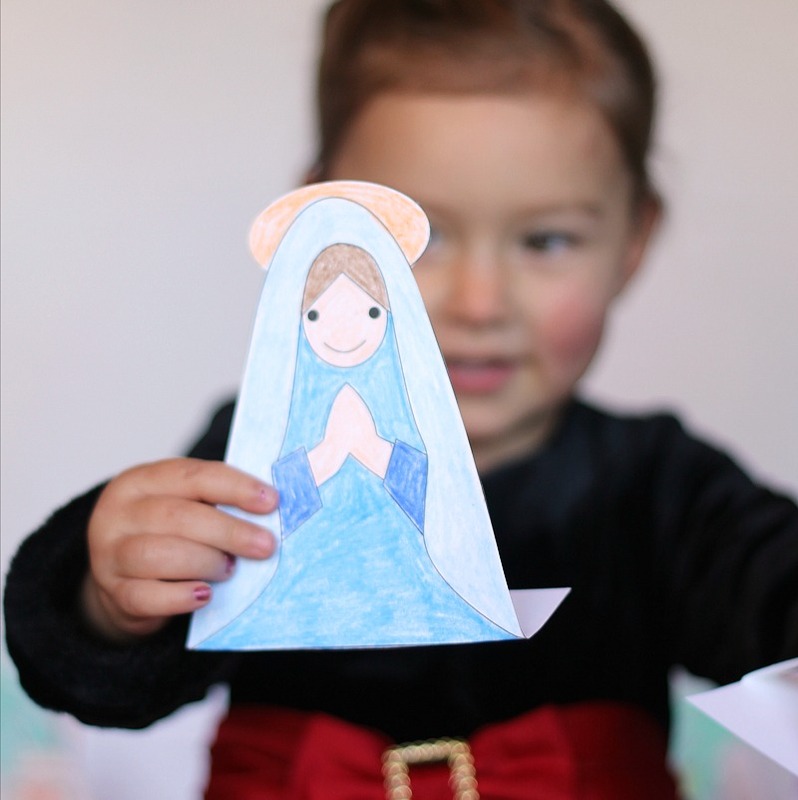 It’s simple, it’s sweet and you can have it all set up and ready for Advent without hours of tedious work. Print it out, set out the box of crayons, cut them out and you are set. Thank you for all of your support in the past and I really hope that this nativity set advent calendar brings some joy and fun into your homes this season.